Mi Vida Sigue - My Life Continues: Happy Days are Here Again! Today was an amazing day. First, we found the Consulate of Uruguay. We were the only ones there with one woman on the 31st floor and an amazing view of the city of Curitiba. I don´t need a visa and Andre will be able to pick his up at the border as we´re crossing from Brazil. It costs about $45 and it´s possible because my friend Gabriel is sending us a letter of invitation with his address and phone number in Montevideo. Gabriel is from Mexico, but stays at my place each summer, working at Marini´s to earn money for his studies. He´s studying in Montevideo for a semester and loves it. He loves it so much, he says he´s falling behind in his studies, but plans to buckle down soon. Then the best news -- we found an authorized Macintosh repair store. The technician who speaks perfect English diagnosed my dead hard drive. Because of my 3-year extended warranty, he´s replacing it for free. By luck he has one in stock so I can pick it up tomorrow. Wow! There really is a God. 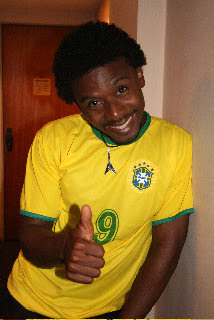 And big news for Andre, he found a Brazilian soccer jersey with his favorite player Ronaldo´s name and number.